The sign outside the door read "Cinema Club", but inside, a Catholic priest was conducting Friday mass in Arabic for Gaza's furtive Christians. It would be a near-miracle if this message of Gaza's hardship ever reaches the Pontiff. Ever since Islamic militants Hamas seized control of Gaza in summer 2007, Israel has barred the exit of all Palestinians except those who need life-saving medical treatment. Security has tightened even more since Israel's 22-day military assault on Gaza, which ended in January. The Vatican and the Latin Church in the Holy Land are also pleading with Israeli authorities to make a goodwill concession and allow Gaza's Christians to see the Pope. Says Father George, who officiates mass at the Cinema Club: "All they want is 24 hours of freedom to see the Holy Father." 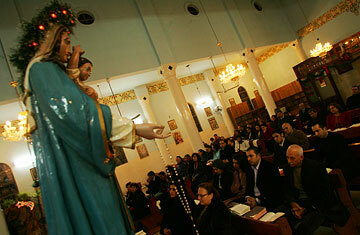 To be a Christian in Gaza these days requires discretion. When I approached a group of Christians lunching in a beachside hotel  they were identifiable because the women did not wear Islamic headscarves  they insisted that Hamas is tolerant of their faith. But one man grabbed my sleeve and pulled me aside. "We can't talk openly. Hamas leave us alone. But there are many [Gazans] who are more fanatical, and they hate us," he said. The young Christian says that in 2007 the manager of a Christian bookstore in Gaza was shot dead. Early last year, he adds, armed gunmen stormed the local YMCA and tossed a bomb into the library, destroying thousands of books. Hamas condemned both attacks but never made any arrests. The head of a Christian relief organization was also asked by Hamas to leave Gaza after accusations that his staff were trying to convert Muslims to Christianity. One Catholic nun from Slovenia brushed aside these worries. "We practice our faith, but we do it quietly," she says. "And people here respect us." In Gaza, those Christians who can wrangle a way of leaving, do. The ancient seafront city once had a thriving Christian community, but now it is down to 2,500 souls. They emigrate to Australia, the United States, Lebanon, anywhere they have relatives who can help them get started on a new life. Many attending the Friday service are widows dressed in black and men with hearty singing voices but shoulders stooped with age. Throughout the Holy Land, an exodus of Christians is taking place. The official Israeli line is that the Christians inside the Palestinian territories are leaving because the Islamists are harassing them. But Christians deny this. Instead, they blame the Israeli "security fence" enclosing Bethlehem and its nearby hilltop Christian villages which blocks the free movement of Palestinians, Christians and Muslims alike, inside the West Bank. Still, it is nowhere near as restrictive as the closure around Gaza. Given that the Pope is German, much of the emphasis of his "pilgrimage" to the Holy Land has been to improve ties with the Jews and the state of Israel, which the Vatican only recognized in 1993. Arab Christians say that have no objection to the Vatican reaching out to Jews, but at the same time, they don't want the Pontiff's visit to gloss over their own troubles with the Israelis. Says George Said, a Bethlehem property dealer: "If the Pope continues to keep quiet about the suffering of Christians from Israelis, a day will come when the churches of Bethlehem and Jerusalem are turned into empty museums without a single Christian." Another Bethlehem Christian named Nadia says she would like to see the Pope endure the same difficulties as Palestinians do every day while crossing the Israeli checkpoint. "The Holy Father would have to stand in line for several hours, then remove his belt and shoes and cross just to get past the security barrier," she muses. The Christians in Gaza would willingly run such a security gauntlet to see the Pope. But for them, the border into Israel remains closed. If the Israeli security officials do not allow them out tomorrow, they may miss the Pope's visit entirely. "All we can do is pray," sighs Father George. "It's in God's hands." Read the five things the Pope must do in the Middle East. See pictures of Pope Benedict's path.